Sesame Street seems to have been around forever. Everyone I knew grew up with it, and had their favourite, whether it was Grover or Ernie or Bert or my personal favourite, Oscar the Grouch. Ask a kid whose their favourite is these days, and inevitably it will be Elmo – the little red monster who is the youngest on the street and loves everyone. 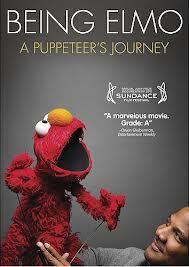 Elmo is puppetted by Kevin Clash, a gentle man who from a very young age pursued his dream of puppets. This documentary is a pretty straightforward record of how he got there. As a child, he watched the emergence of the Muppets and the amazing talents of Frank Oz and Jim Henson on television and his supportive parents ensured every possibility to meet his dream, even if it meant chopping up jackets to make early puppets. The thing that makes this documentary interesting is that Kevin is a man who is so passionate about his work and passionate about the world he worlds in. He has taken advantage of the opportunities that life has given him and made a marvelous career inspiring children and adults the world over.